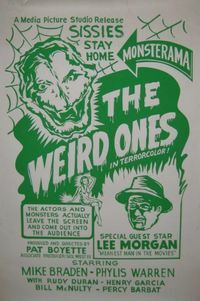 The Weird Ones is a low-budget 1962 sexploitation comedy film directed, written, and produced by Pat Boyette. The 76-minute black and white film was shot in San Antonio, TX, and it was screened for the first time in February 1962. The film is reportedly about a couple of press agents (acted by Mike Braden and Rudy Duran) specialized in promoting naked women, who team up to stop the Astronik, a space alien devoted to torture and murder young ladies. In order to lead the Astronik into a trap, the protagonists use an extra-terrestrial "Cosmo-Cutie" as a bait, this character serving as a pretext for several softcore erotica scenes. All negatives, related promotional materials, and copies of The Weird Ones were, according to Boyette himself, destroyed in a garage fire, with only the theatrical poster surviving. Whether or not another copy is held by the theatrical distributor is open to conjecture, as "Crescent International Pictures" has shown no signs of life since 1969, with just a few sexploitation films of questionable quality under their belt.